Exhibition Revisits Photographs Edward Weston Made for Whitman's "Leaves of Grass"
SAN MARINO, Calif. - An exhibition opening this fall at The Huntington Library, Art Collections, and Botanical Gardens considers a rich dialogue between two iconic figures in American culture: the renowned photographer Edward Weston (1886-1958) and poet Walt Whitman (1819-1892). “Real American Places: Edward Weston and Leaves of Grass” opens Oct. 22 in the Chandler Wing of the Virginia Steele Scott Galleries of American Art and continues through March 20, 2017. The exhibition is curated by Jennifer Watts, The Huntington’s curator of photography, and James Glisson, Bradford and Christine Mishler Assistant Curator of American Art. The 25 photographs included in the exhibition illuminate an understudied chapter of the celebrated photographer’s career. In 1941, the Limited Editions Book Club approached Weston to collaborate on a deluxe edition of Whitman’s Leaves of Grass, which Whitman published in five ever-larger editions during his lifetime. The publisher’s ambition was to capture “the real American faces and the real American places” that defined Whitman’s epic work. Weston eagerly accepted the assignment, and, from 1941-42—on the eve of the United States’ involvement in World War II—he set out with his wife, Charis Wilson, on a cross-country trip that yielded a group of negatives marking the culmination of an extraordinarily creative and prolific period in his career. Most of the images were made with a large, 8 × 10 camera and captured a wide-ranging landscape and set of experiences across 24,000 miles, from California through the Southwest and South, up to New England and Maine. The announcement of Pearl Harbor’s bombing in Dec. 1941 caused Weston and Wilson to abort their trip and hurriedly retrace their route to California. While Weston believed the photographs to be some of his best, the resulting Limited Editions publication, which is on view in the exhibition, proved a failure on many fronts. The pages were tinted a sickly green, said Watts, and, likewise, “Weston’s elegant black and white pictures were surrounded by a mint green border, much to the photographer’s disgust. The final indignity came with the pairing of Weston’s pictures with specific lines in Whitman’s text, a decision Weston rightly felt undermined his own vision of America.” As a result, the photographs from the Leaves of Grass project have been relegated to footnote status in Weston’s oeuvre. Among the pristine prints to be featured are White Sands, New Mexico (1941); Woodlawn Plantation House, Louisiana (1941), and Gulf Oil, Port Arthur, Texas (1941), each 7 ½ by 9 ½ inches. The group builds on subjects that Weston already knew and loved: the industrial sites of Middletown steel; the broad expanse of desert with its confounding sense of scale; New Orleans’ aboveground graves that he flattens out like a Point Lobos tide pool. Though Weston deemed the book a failure, he considered the photographs an unqualified success. 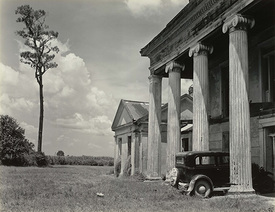 In 1944, he selected and printed 500 photographs for The Huntington as a gift to establish the most significant institutional legacy of his lifetime. Of this remarkable group, 90—almost one-fifth the total—are pictures he took for the Whitman project. In 2003, The Huntington acquired Charis Wilson’s typescript diary recounting every aspect of the journey, which is on view in The Huntington’s Library Main Exhibition Hall, as well as documentation detailing the contentious creative wrangling between Weston and the Limited Editions publishers, both of which significantly informed the research for this exhibition. The Library’s manuscript and rare book holdings also include a number of original Whitman items, including a sampling of Whitman’s draft pages and his handwritten corrections on printed proofs for Leaves of Grass. Some of those pages will be on display in the exhibition.